In 2011, QAHN is very pleased to announce that the recipient of the Marion Phelps Award is Carol Martin of the Gatineau Valley Historical Society. Since 1991, Carol has been the editor of Up the Gatineau, the annual local history journal of the Gatineau Valley Historical Society. To date, she has edited twenty-one volumes of this publication. 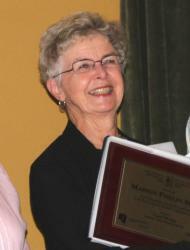 Carol has been a member of the GVHS executive in various capacities since 1976. She has been a long-time volunteer archivist at the Chelsea Library and has been responsible for assisting the public with a variety of inquiries related to local genealogy, cemeteries and census records. In addition, Carol has volunteered with the annual GVHS antiques and collectibles auction, and has served as a citizen member on the Heritage and Culture Committee of the Municipality of Chelsea.